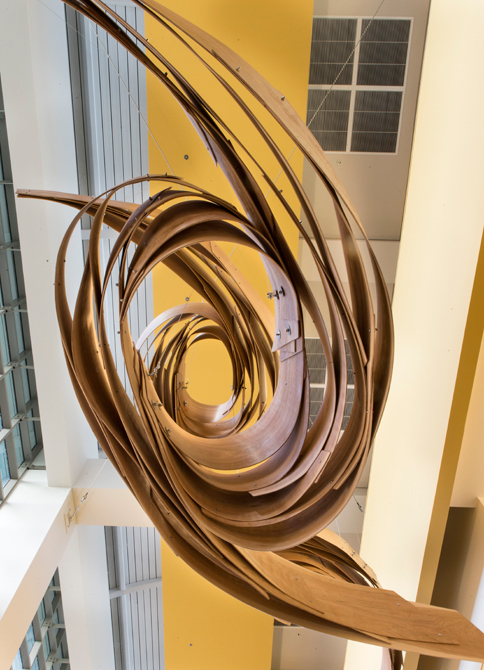 My interest with public art projects is that of working with a client to develop art that integrates and embodies the function of a particular space. 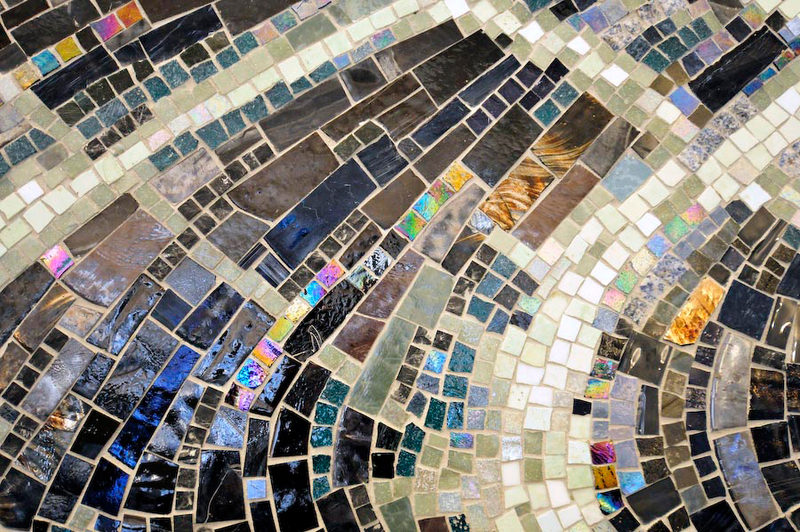 While my studio work involves researching unique natural environments, my public artwork arises from learning about the nature of a unique community and geography and turning what I’ve learned into the metaphor of form. 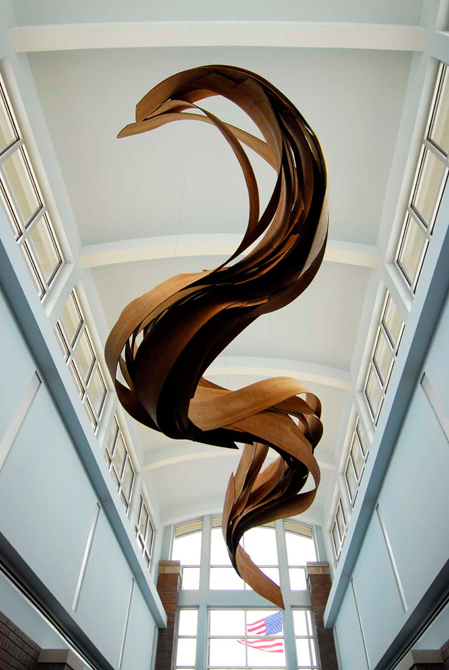 I work fluidly between two- and three-dimensions using materials as diverse as mosaic, painted glass, wood, cast-iron, and steel, which provide me a lot of versatility to develop the unique identity of each situation. Though my imagery is abstract, nature is always my place to begin developing an image. Natural forms are a common language that all cultures share no matter how diverse our backgrounds and focus might be. I try to develop images and forms that allow for a poetic and layered interpretation. Circuit was created for a library that places itself at the cultural center of the town. The idea for the sculpture developed from the relationship of the library to the train station and the importance of the underground railway in the history and identity of the town. Both infer expansive movement outward. Similarly, a trip to the library enables a mental journey into a larger context by supporting a progression from the comforts of a community to the comprehensiveness of the world. The materials of wood and metal from which “Circuit” is made, contrast the wooded nature of the town and the layered papers of books with both the electronics of technology that extend the library’s resources and the industrial nature of the railroad that connects the town to a larger context. 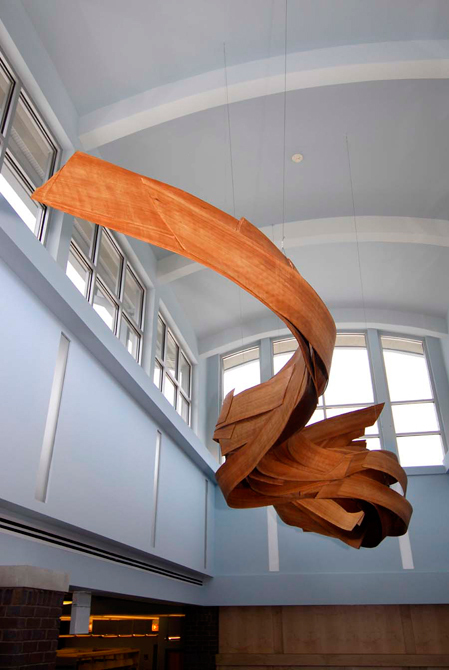 Wood and metal suspended structure (36’ x 12’ x 8’); Florida Gulf Coast University Library, Fort Myers, FL. In environmental ecology, an ecotone is a place where two different habitats meet. While an ecotone has some of the characteristics of each bordering community, it also has certain plant species that are not found in either. The influence of the two bordering communities on each other is known as the “edge effect” and it is where much wildlife activity occurs. 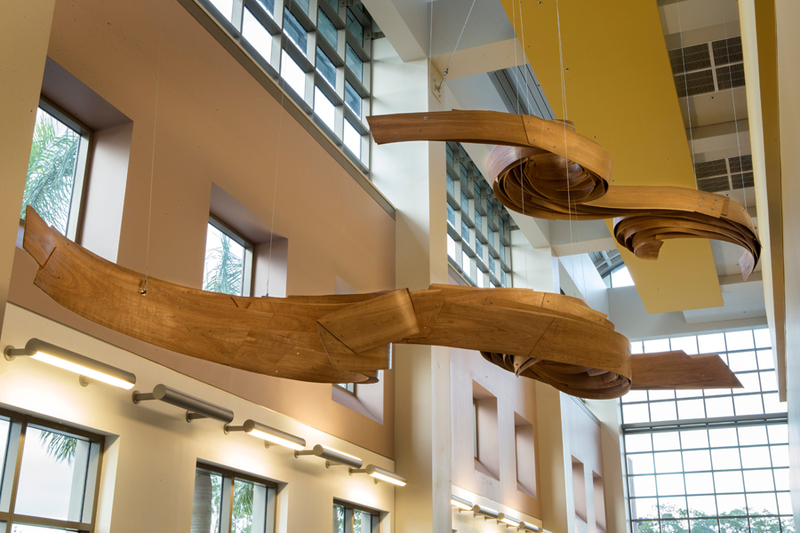 Ecotone reflects the fact that the library at the nexus of the university is a place where different areas of study meet, overlap, and generate new ideas and energies beyond the confines of the individual disciplines that it supports. 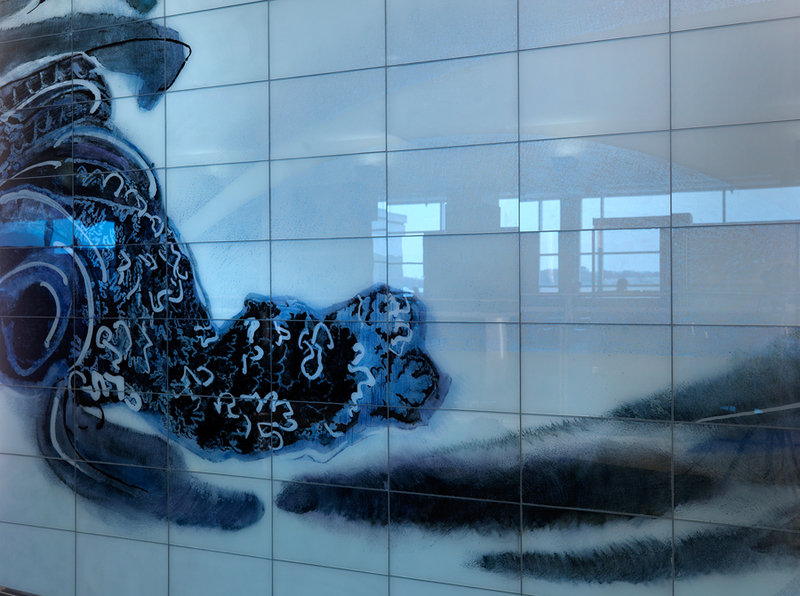 Hand-painted, fired-glass tile mosaic (82’ x 16’); TF Green Airport, Providence, RI. The image reflects the tension inherent in any airport where the science of flight contrasts with the forces of nature, ranging from weather conditions to flows of people. 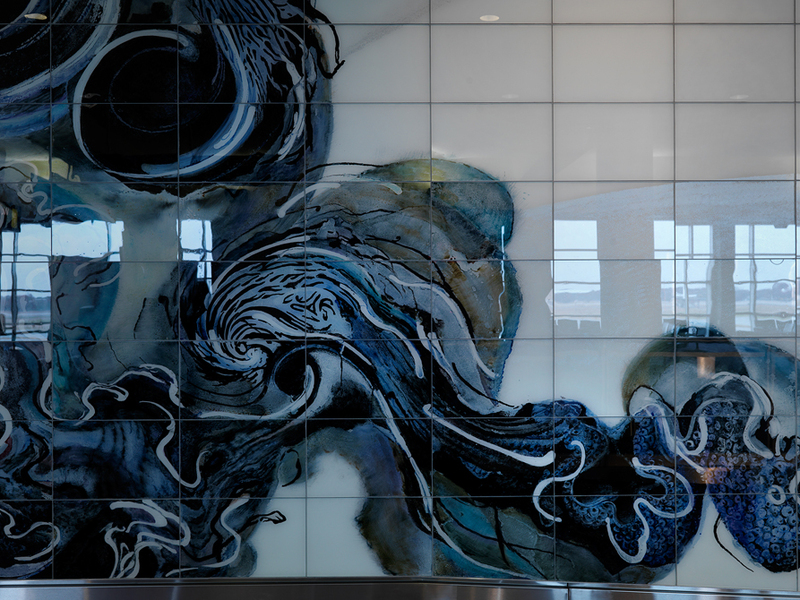 Water is used as a metaphor for fluidity of movement in traversing spaces and functions. 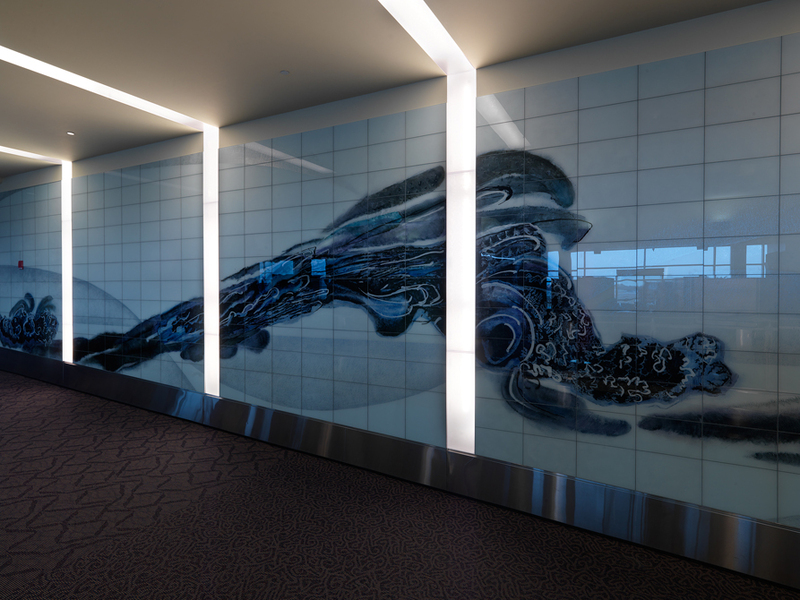 The piece serves as a wayfinder for passengers exiting the concourse. Passengers move from the open terminal area with high ceilings and daylight-filled space down a ramp with vertical flourescents into a narrow hallway with a low ceiling on their way toward the baggage pickup. The image mirrors the movement of passengers: starting at the base of a waterfall, walking alongside the waves, submerging below the surface of the water. The underlying structure for the drawing is the Fibonacci series, a rhythmical mathematical sequence that grows proportionally and is pervasive throughout the natural world. 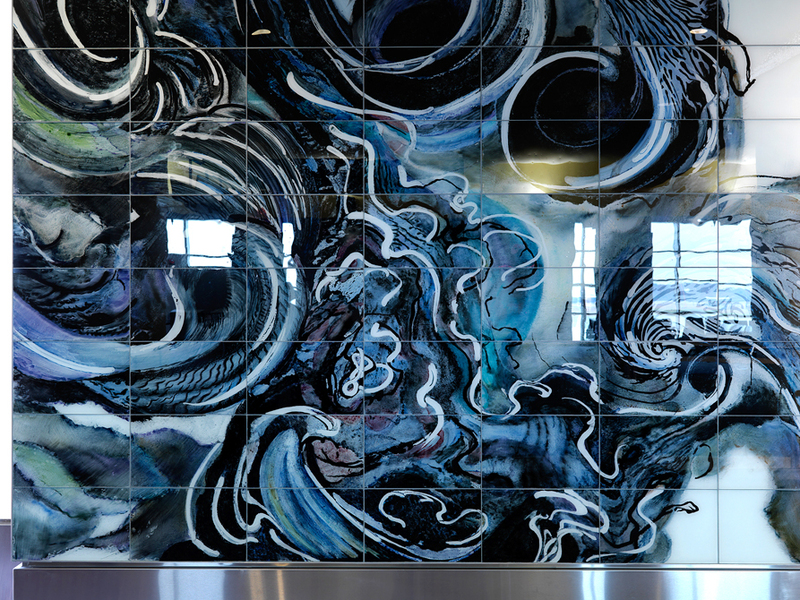 The wave forms, painted on tiles fabricated by Franz Mayer of Munich, Germany, are composed of collage elements from found photos and drawings of sea organisms, plants, grain patterns in wood, sand formations, and patterns on the surface of shells, all related flow forms and patterns in the natural world. 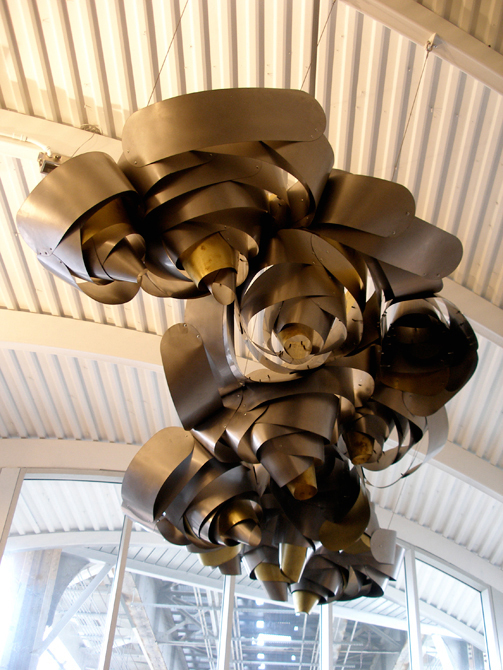 Riveted stainless steel and brass suspended sculpture (3’ x 11’ x 6’) and glass and stone mosaic (6’ x 15’); Entryway, Paulina Stop, Chicago Transit System’s Brown Line. The forms mirror the fluid, ephemeral, high-energy cellular neighborhoods of the city and the connections and intersections between them which public transportation facilitates. 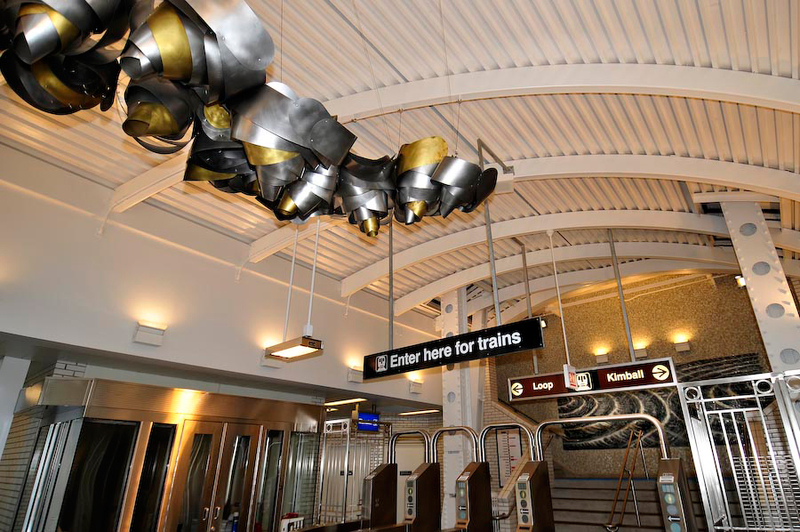 Passengers enter the station under the stainless and brass suspended sculpture, constructed by Vector Custom Fabricating in Chicago. As they go up the stairs that split off in opposite directions, they encounter a glass wall mosaic fabricated by Franz Mayer of Munich, Germany. 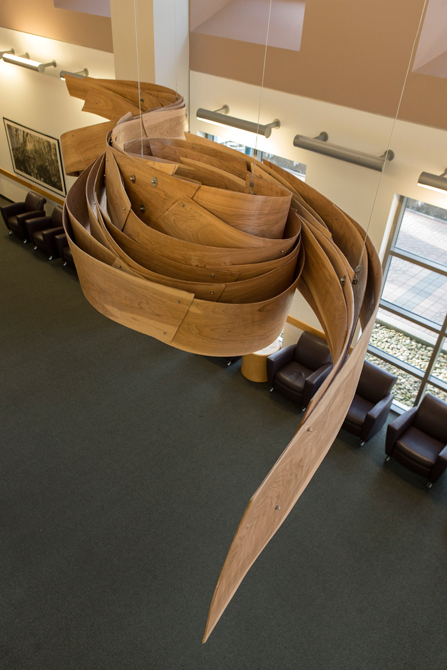 Wood structure (6’ x 5’ x 20.5’); Avalon Branch Library, Chicago, IL. 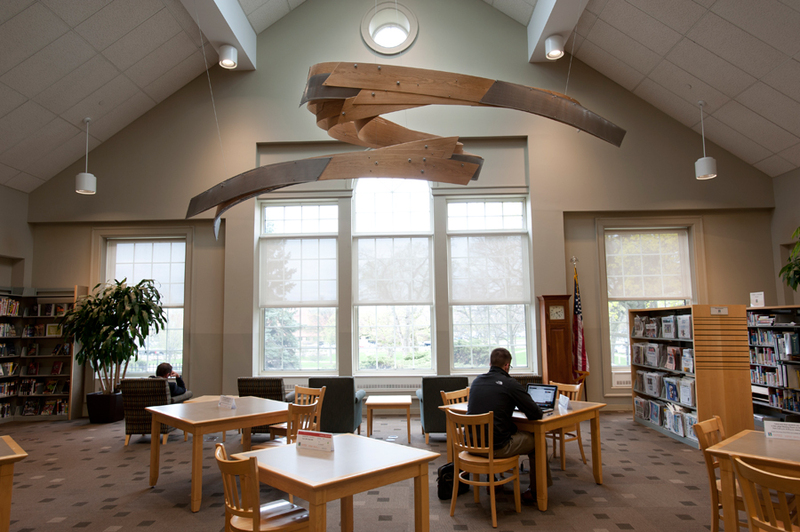 Current grew out of thinking of the library as a place that makes waves in a community—the ripple effect that results from reading, learning, and discovering. It is a place for interacting, finding resources, and for understanding where we have been and where we might go. 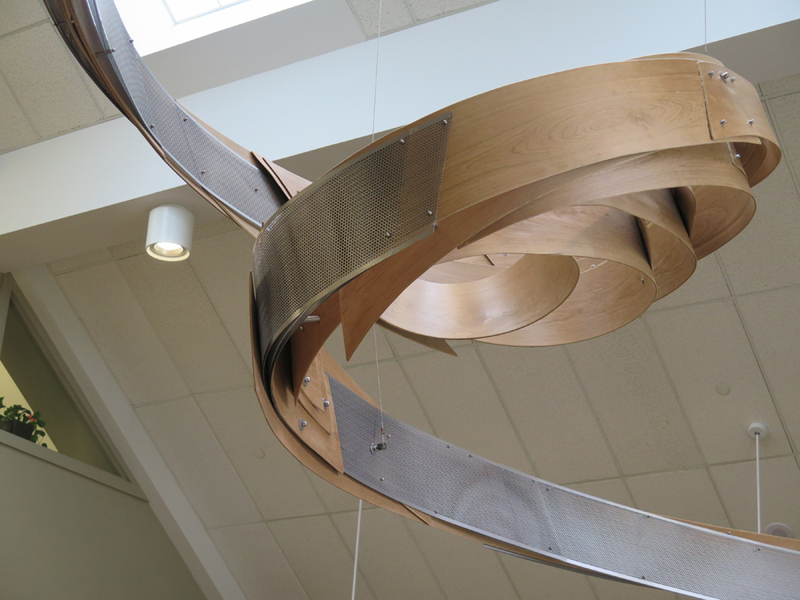 The spaciousness of Avalon Branch Library’s 30-foot high atrium draws the visitor to look up toward the light. It is a space that leads the visitor into the community room and the library itself. 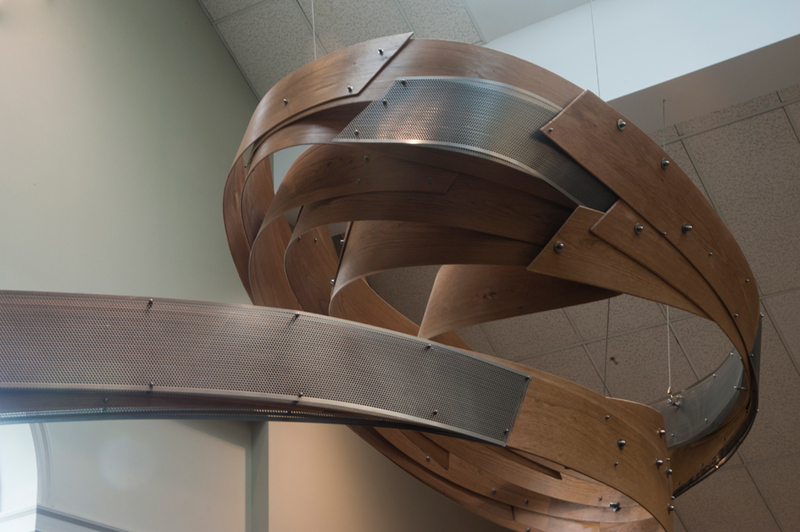 The horizontal aspect of the sculpture is intended to draw the visitor toward these connections and serve as a transition from the exterior to the interior. Current builds on the quality of water that is already embodied in the intersecting, concentric rings of the terrazzo floor and the translucent blue-green of the countertops as well as on the concept of what a library can be. Current references various metaphors embedded in the idea of a library. Layering, found within the pages of individual books and amplified in the amassed collection of books, of which a library is made, becomes the process through which the piece is constructed. These layers reference time and history. 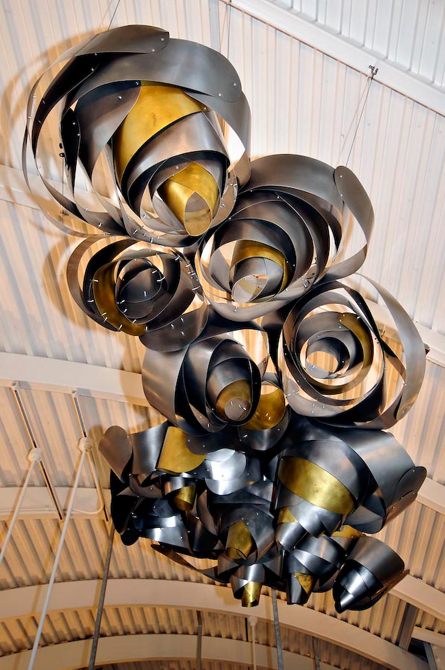 Current’s fluid form refers to the growth of ideas, their plasticity and resilience.